In light of this, who should Roderick’s family fear more? At least, more than each other? Violetta Dalmaine…or the Horrible Hand? Both are on the prowl tonight! Corwin McCloud, famed historian of the EERIE SERIES, as the legendary collection of camp horror films made by the eccentric—and tragic—writer/director Anthony Miles is known worldwide today, has provided a unique, thoroughly-researched documentation of Miles’s landmark first picture, THE HORRIBLE HAND! This fascinating framework enhances thoroughly a masterful novelization of the film’s plot, complete with dialogue and scenes excised prior to release! THE HORRIBLE HAND!…It grabs you and NEVER lets go! And after all these years, its grip is tighter than ever! Originally dismissed as a routine schlock old-dark-house thriller in 1954, time has finally done justice to the spiritual ponderings of THE HORRIBLE HAND! ; its themes of atonement and the miraculous power of God’s touch to transform even the least redeemable of souls. These themes have all been preserved in the film’s novelization…and are also examined in direct reference to the troubled life and mysterious fate of Anthony Miles himself. The Horrible Hand! is available for purchase here. Quite an ambitious notion, to be sure, but every artist begins with a vision, right? Years ago, I had the idea of creating a series of illustrated “vintage” screenplays with fictional background information on the films they were eventually made into by their author—who, as in the style of Orson Welles, was also their producer, director, sometime lead, etc. The intention I had was to tell two stories in one—the film story and that of what went on behind the scenes. At that time, I had intended to illustrate these screenplays whimsically with photographs of my own miniature “actors” on and off the set. Then, not long ago, I considered using real people from the local acting pool, costumed and posed amid appropriate settings, real or digitally supplied from stock photography. Would it work? I didn’t see why not. The main obstacle here would be getting all the people together as needed, and getting hold of some 1940s-style costume pieces and props. But I’ve done it before. And at this time, after some thought, I’m considering a mixture of the two concepts, by using public-domain photos of anonymous people as my “actors”, with stock backgrounds, fleshed out with my own drawings. I think it would be a most interesting and intriguing venture. Again, it certainly would be ambitious, especially if I’m looking at a whole lineup of these types of works, to eventually be tied together by a common event which happens during the “filming” of the fictional movies. Something in me, though, wants to give it a try, so this year, it begins. I’ll start by creating the plots for the “movies”, and then the various autobiographies and backgrounds for the actors and personnel who made them…especially the producer/director. The real inspiration for this project had its genesis in my childhood…when I stumbled across the Crestwood House Movie Monsters book series in my local library. 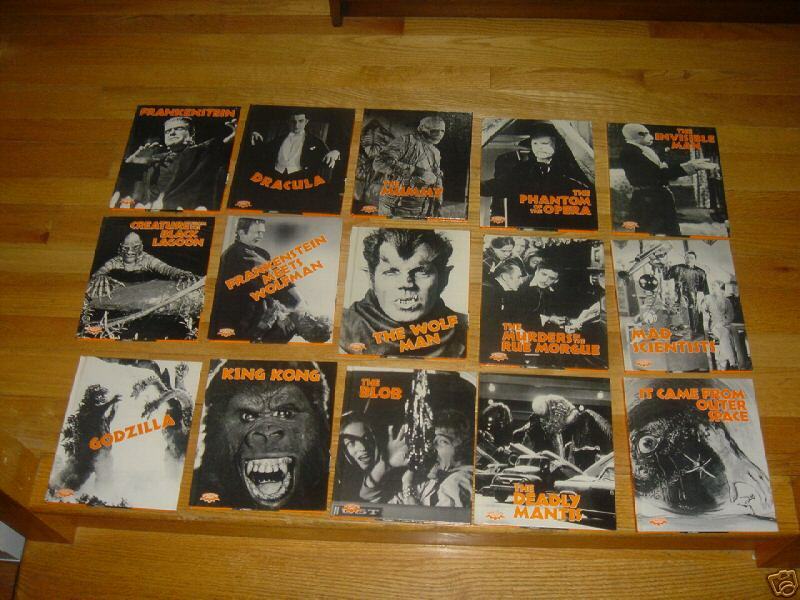 This was a series of hard-backed storybooks based on all the classic Universal horror films—Dracula, Frankenstein, The Mummy, The Wolf Man, The Invisible Man—along with plenty of supplemental material on other films in the same genre, including sequels. I spent many hours poring over these books, fascinated by the stories and, of course, the quantity of photographs with which they were lavishly illustrated. It was a surprise to me, when I recently did some research on this collection, to find that the books are a very hot (and expensive) rare item constantly sought after on Ebay and Amazon. I do plan to eventually own the Crestwood Movie Monster series—it’s not an if or a maybe, it’s a must. The first volume of the projected Eerie Series, The Horrible Hand!, tells the story-within-a-story of novice low-budget horror film director Anthony Miles, who battles the skeletons in his own personal closet while trying to realize his lifelong dream of making a feature film with not nearly enough money, clueless producers, actors of uneven talent, and an aging prima donna star of classical English theatre, Sir Gavin Brigham. The novel alternates narratives between that of the drama behind the camera and that enfolding before it; a fairly routine murder mystery at first glance (greedy relatives gather at the old homestead for the reading of the murdered patriarch’s will), but which diverts into territory unusual for the genre–namely, the various opportunities for spiritual redemption which the characters encounter during their long, stormy night in the family mansion together. I worked for over two years on this project, and I like to think that it shows. I certainly enjoyed both the writing and the illustrations, a few of which are displayed below; basically public domain photographs of people and settings merged together and stylized. I threw myself into it as I did mostly because, as I mentioned, I’ve been brewing this concept for many years, and was incredibly eager to see whether it would work. I think it did, and judging from the three people who have read it so far, I must be right, at least to a degree. Yes and no. And that’s all I will say for now. The Horrible Hand! is scheduled for a fall 2017 release, just in time for Halloween (hopefully). I already have plans to showcase it at two local libraries and the Books a Million where a lot of it was written. I have eleven more installments planned for the E.S., with the intent of writing another book every two years.